ww2dbaseLéon Joseph Marie Ignace Degrelle was born in Bouillon, Belgium in 1906. He studied law at Université catholique de Louvain in Louvain-la-Neuve, Walloon Brabant, Belgium. Upon graduation, he became a journalist with the publication Christus Rex. Until 1934, he was its correspondent in Mexico. In 1935, he and other like-minded nationalists broke away from the Catholic Party and formed the Rexist Party. In 1936, he met with both Benito Mussolini and Adolf Hitler, both of whom supported the Rexist Party monetarily. ww2dbaseWhen the European War broke out in 1939, Degrelle supported King Leopold III's neutral stance, but as German troops poured across the Belgian border, his past history with the Nazi Party led to his arrest and brief detention in France. After the German conquest of France and the Low Countries, he returned to Belgium and began active collaboration with the occupation administration. In Aug 1941, he joined the Walloon Legion to fight on the Eastern Front under the German banner; in doing so, he passed the leadership of the Rexist Party to Victor Matthys. With the Walloon Legion, he participated in the invasion of the Soviet Union as a part of the German Army. In Jun 1943, Walloon Legion was transferred to the Waffen-SS as 5th SS Volunteer Sturmbrigade Wallonien. In 1943, he was excommunicated by the Catholic Bishop of Namur, but the excommunication was later reversed by the German military chaplaincy. He was wounded in combat in Cherkasy, Ukraine in 1943. By Apr 1944, he had achieved the rank of SS-Standartenführer and was awarded the Knight's Cross of the Iron Cross with Oak Leaves. On 2 May 1945, he was promoted to the rank of SS-Brigadeführer and Generalmajor der Waffen-SS by Heinrich Himmler; since Himmler had been stripped of all his positions by 28 Apr 1945, this final promotion was not considered official. He fled Germany some time in early May, traveling across Denmark to Norway, where he boarded a He 111 aircraft for Spain. The aircraft crash landed in San Sebastian in Northern Spain, severely wounding him. He was protected by the Spanish government (who handed over a Degrelle look-alike to the Allies when extradition demands were made) during and after his recovery. Belgium convicted him of the crime of treason in absentia, sentencing him to death by firing squad. ww2dbaseDegrelle gained Spanish citizenship in 1954; the false name José León Ramírez Reina appeared on his citizenship papers. He headed up a construction company working closely with the government, and was often seeing attending public events wearing his German military medals. He was involved with the Spanish neo-Nazi group Círculo Español de Amigos de Europa (CEDADE) from its inception in 1966, managing its publishing arm and writing for its publications. He was a Holocaust denier. He passed away from cardiac arrest in a hospital in Málaga, Spain in 1994. 15 Jun 1906 Léon Degrelle was born in Bouillon, Luxembourg Province, Belgium. 12 Feb 1942 Léon Degrelle was promoted to the rank of Gefreiter. 28 Feb 1942 Léon Degrelle was promoted to the rank of Oberfeldwebel. 3 Mar 1942 Léon Degrelle was awarded the Iron Cross 2nd Class. 1 May 1942 Léon Degrelle was promoted to the rank of Leutnant. 25 May 1942 Léon Degrelle was awarded the Iron Cross 1st Class. 15 Aug 1942 Léon Degrelle was awarded the Eastern Front Medal. 25 Aug 1942 Léon Degrelle was awarded the Infantry Assault Badge in Silver. 1 Jun 1943 Léon Degrelle was promoted to the rank of SS-Obersturmführer. 25 Jul 1943 Léon Degrelle was asked to leave a Catholic mass for wearing the SS uniform; military uniforms had been banned from masses by the Belgian Roman Catholic Church in 1940. 30 Nov 1943 Léon Degrelle was awarded the Close Combat Clasp in Bronze. 1 Jan 1944 Léon Degrelle was promoted to the rank of SS-Hauptsturmführer. 13 Feb 1944 Léon Degrelle was made the commanding officer of SS Volunteer Sturmbrigade Wallonien upon the combat death of his predecessor Lucien Lippert in Ukraine. 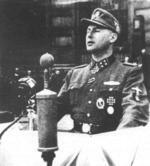 20 Feb 1944 Léon Degrelle was awarded the Knight's Cross the of Iron Cross. 20 Feb 1944 Léon Degrelle was awarded the Wound Badge in Silver. 19 Mar 1944 Léon Degrelle was awarded the Close Combat Clasp in Silver. 19 Mar 1944 Léon Degrelle was awarded the Wound Badge in Gold. 20 Apr 1944 Léon Degrelle was promoted to the rank of SS-Sturmbannführer. 22 Aug 1944 Léon Degrelle was mentioned in the Wehrmachtbericht. 27 Aug 1944 Léon Degrelle was awarded Oak Leaves to his Knight's Cross the of Iron Cross. 14 Sep 1944 Léon Degrelle was awarded the Close Combat Clasp in Gold. 9 Oct 1944 Léon Degrelle was awarded the German Cross in Gold. 1 Jan 1945 Léon Degrelle was promoted to the rank of SS-Obersturmbannführer. 20 Apr 1945 Léon Degrelle was promoted to the rank of SS-Standartenführer. 2 May 1945 Léon Degrelle was promoted to the rank of SS-Brigadeführer and Generalmajor der Waffen-SS by Heinrich Himmler, although Himmler had officially lost all his positions on 28 Apr 1945. 7 May 1945 The He 111 aircraft which Léon Degrelle traveled aboard, having run out of fuel, crash landed on the beach of La Concha, San Sebastián, Spain. 31 Mar 1994 Léon Degrelle passed away from cardiac arrest in a hospital in Málaga, Andalusia, Spain.